Reader, let me tell you, the the jacketflap does this book justice. It does more than that. Fifteen-year-old, rebellious orphan Sage lives in a world of thievery and lies. Barely living on what he can by stealing and what the orphanage provides, he is paid for and forcefully plucked from the orphanage by a mysterious noble-type with four other orphan boys of similar age from neighboring orphanages. It is quickly revealed to Sage and the other orphan boys the identity of the mysterious man, Bevin Conners, a regent to the king of the land of Carthya. Carthya is on the verge of Civil War, and to stave off a bloody and long battle Conners has a secret, yet deadly plan. In just two weeks time he will train the orphans to impersonate the lost prince of Carthya, who disappeared 5-years ago and is thought to be dead. The one who can most successfully mirror this lost prince will claim the throne and rule as King of Carthya. But, only one boy can become Connor’s false prince. As for the the others… well… It’s a fight to claim the throne as much as it is for their lives. Adventure, secrets, lies, political turmoil, and friendship forged in desperation; this fast-paced, page turner has it all. It’s deliciously entertaining and so much fun to read. 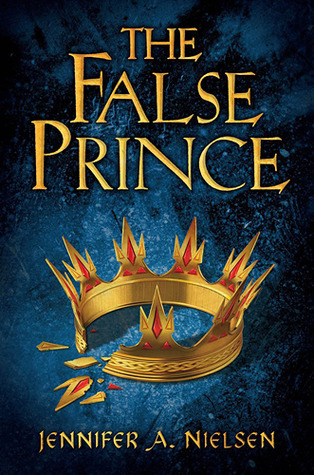 Upon finishing, I now join the other anxious readers enduring the wait until March 1, 2013 when The False Prince‘s much anticipated sequel, The Runaway King, is released. Only 45 more days! Oh, I will have to check this one out! And nice to know the sequel will be out soon. You should, Molly! I thought it was really well done. And a movie is in the works! The executive editor of Game of Thrones was hired by Paramount to adapt the book into a film. Yes. I’m so ready to read The Runaway King but then we will just have to wait for the conclusion. The Thief is one of my all time favorites. (It’s sequel is my favorite book of all time.) I hope you like it.